The Texas death chamber in Huntsville. 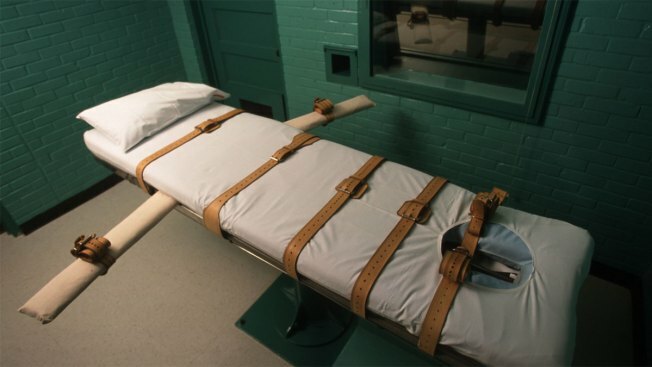 A judge has ordered Texas to release the name of the compounding pharmacy that provides the state its execution drug, but attorneys pushing for the disclosure said Friday that they don't expect to get the information anytime soon. District Judge Darlene Byrne ruled Thursday that the company's name is a matter of public record, despite arguments from the Texas Department of Criminal Justice that disclosing it would be a safety risk. Texas had released the name of its drug suppliers for years, but in May, Attorney General Greg Abbott changed course and cited undisclosed threats made to a new company supplying the drug. Similar fights are ongoing in other death penalty states like Oklahoma, Missouri and Ohio. But courts — including the U.S. Supreme Court — have yet to halt an execution based on a state's refusal to reveal its drug supplier. In Texas, Byrne sided with attorneys who filed a lawsuit earlier this year pushing for disclosure of the names of the company that supplies the execution drug and of the compounding pharmacy that prepares the drug when it's used for executions. Two of the suing attorneys, all of whom regularly work with death-row inmates, said the ruling is a victory even though they don't expect the state to release the names pending its appeal. "This is about the drugs, but it's also about open government," attorney Maurie Levin said. Fellow lawyer Phil Durst said the drugs "are coming from somewhere, and who is the compounder is a vital piece of information." The Department of Criminal Justice plans to appeal, according to spokesman Jason Clark. He said the state maintains that "disclosing the identity of the pharmacy would result in the harassment of the business and would raise serious safety concerns for the business and its employees." Clark also noted that state and federal courts have often sided with states on the issue. The lawsuit originally included two Texas death row inmates, but both have since been executed. Durst said the case now moves to an appeals court in Austin but may eventually be heard by the Texas Supreme Court. Texas uses one drug during its lethal injections, pentobarbital. Abbott — who was elected governor in November — had long said that the benefits of government transparency outweighed the Department of Criminal Justice's desire to keep information secret about its execution-drug supplier. Jailed 10-Year-Old Accused in 90-Year-Old's Murder "Misses His Mom"
But during his campaign for governor seven months ago, the Republican changed his mind and said the drug supplier's identity should remain secret.